Our last meal in San Diego was at Salud! 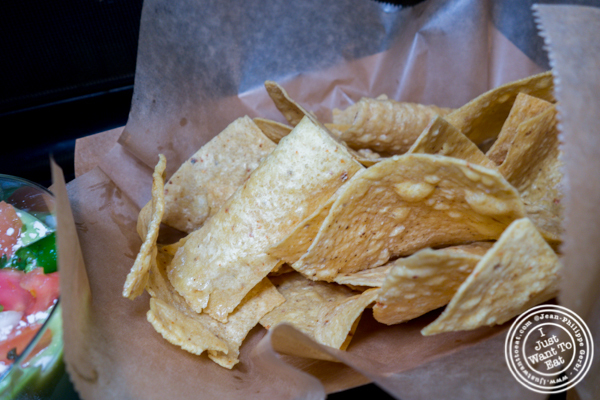 By San Diego Taco Company, a popular Mexican restaurant located in Barrio Logan. Crowded inside with a long line outside, I was really excited to try it. And I was even more when inside, the decor being really beautiful with its murals that are tattoo inspired and the car hoods on the wall. It is a fast casual place: you order at the cashier, they give you a number and then you pray you can find a spot to sit…Few minutes later, your meals comes. Easy, but then I forgot the idea to have their churros with ice cream thinking that if ordered at the same time as the rest, the ice cream would melt and, if I wanted to order later, I would have to queue up again…Too bad they do not have a system where when you finish eating, you can claim your dessert. Fish taco made of beer battered catfish served on a fried handmade tortilla with mixed cabbage, cotija cheese, pico de Gallo and their special house sauce. This was really tasty and I got the tortilla fried that added a nice crunch to the taco, making it even more decadent. Then, Ciara, David and I got the Califas that are made with your choice of meat (we all picked carnitas that is fried tender pork) and french fries on a handmade flour tortilla. 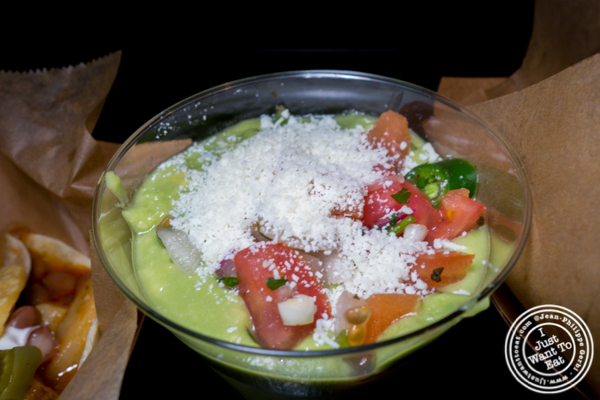 It is topped with guacamole, cheddar cheese, pico de gallo and crema. It was good, except for the guacamole and I was also expecting much more fries…The pork however was delicious! Yes, I mentioned the guacamole that was really not good: it seemed to have been made in a blender that gives a soupy texture and lacks taste. When going to a Mexican restaurant, you would expect the guac to be very good: It is like going to an Italian restaurant and getting a bad tiramisu! On top of that, the description was: “Our famous handmade chips with a large serving of our tableside guacamole topped with pico de Gallo”. The guac was definitely not made table side unless they bring that blender!!! Jodi on her side got the cheese quesadilla that was good. Last was the Mexican street corn, their take on corn on the cob found in the streets of Mexico, made with fire roasted corn, lime, queso fresco, crema and Chile. It was ok, having a bit too much lime that overpowered the whole thing. So overall it was just ok and I admit that I was a bit disappointed with Salud! Considering how crowded it was, my expectations were high and they did not deliver. If I had to pick I prefer Lucha Libre and the Taco Stand.